Learning to express emotions positively, sharing, self-help skills, color and shape recognition, counting and potty training are some things that the children in the Turtle Room are working on. 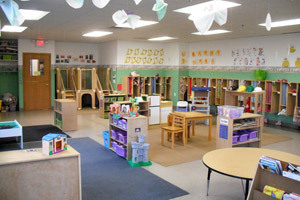 The Turtle Room was designed to provide exceptional care for children aged two and a half years to 3 years. Enrolled families can expect a safe, secure, nurturing, and age-appropriate learning environment. Experienced, well-qualified teachers are staffed at a 1:8 ratio. Teachers are dedicated to responding promptly to every child’s daily needs. Families are provided with daily written reports that accurately summarize the child’s daily activities. 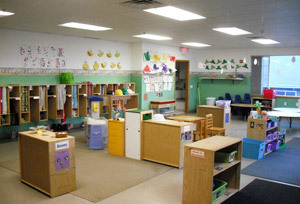 A parent communication area is provided to give a glance at daily activities. In addition to communication at drop off and pick up, families are encouraged to call or visit as desired. Turtles continue to practice consistency by following a daily routine. Teachers foster growth by introducing new experiences through creative play and exploration while encouraging children to learn. Jennifer Smith, co-lead teacher in the Turtle Room, has been working at Here We Grow since May of 2013. Jennifer graduated from Edgewood College with a Bachelor’s Degree in Studies of Education. Jennifer’s experience includes working with children from infancy to 3 years of age. Jennifer’s philosophy is to meet the child at his or her level. She feels it is very important to get down on the floor with the child to interact with them developmentally. In her opinion, it is necessary to communicate with the parents about their child every day. Jennifer also feels that watching children grow and learn is the greatest gift out there. It is her goal to make sure the children are safe and having fun, as well as learning. In her spare time, Jennifer likes to be outdoors. She enjoys working in her garden, growing vegetables and flowers, as well as going on nature hikes around the area. She also loves spending time with her family and friends. Ashley Meyers, co-lead teacher in the Turtle Room, started at Here We Grow in July of 2018. Ashley graduated from Black Hawk Technical College with her Associate’s Degree in Early Childhood Education. Before beginning her career at HWG, she worked at a child care center in Evansville, WI for 6 years. She is very passionate about getting to know each child individually and helping them learn in their own way. Growing up with her dad in the military, Ashley had the privilege of living in multiple states such as Arizona, South Dakota and Alaska. In her free time, she enjoys spending time with her family and friends, camping and traveling.